You're really into MMORPGs when you spend hours repeating the same tasks over and over again to acquire gold. You're way, way too into MMORPGs when you create a custom six-computer setup to do it that much faster. Zhek Kromtor's "Frankenstein" setup lets him play several EVE Online accounts at the same time so he can farm for gold and minerals more efficiently. Just look at those janky six-way keyboards and mice that let him control everything at once! You see, he was temporarily banned for running multiple accounts on one computer at the same time. It's against the rules! But doing this, apparently, is not. Probably because they never thought anyone would be crazy enough to do it. But never underestimate the desire of an addict to get that sweet, sweet gold. 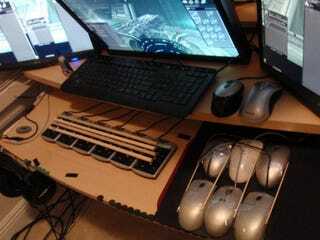 Online Gaming Rig Redefines The Meaning Of "Multiplayer"